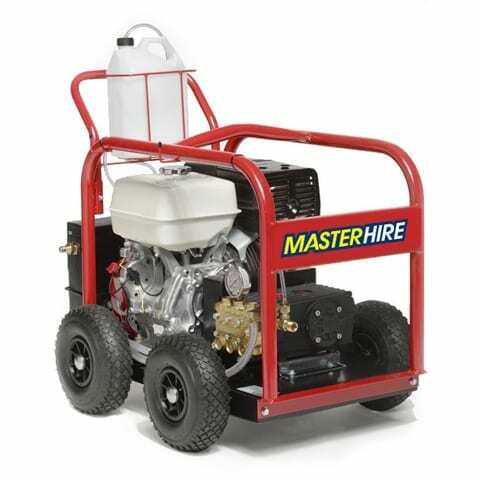 Master Hire, high powered pressure cleaners, ideal for cleaning/removing dirt and stains from concrete and bitumen. The units can be diesel or petrol powered and come with a standard fan lance. These units are able to pump 15L per minute reach up to pressures of 4500 psi when fitted with a turbo head. Along with high power, these machines also have adjustable pressure to allow you to have a low-pressure mode. SKU: PC3000. Category: Cleaning Equipment. Tags: Flood Cleaning Equipment, Gernis, Pressure, Pressure Cleaners, Pressure Washers, Water Blasters.